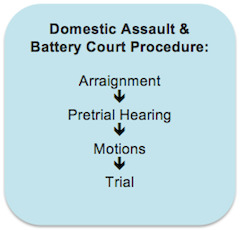 Like any criminal charge, a domestic assault and batter will go through the standard stages of the court process, as outlined below. The arraignment is the first court date. Following the arraignment, the pretrial conference stage is an attempt to explore weaknesses in the Commonwealth’s case and find a way to resolve the case short of a trial. Pretrial probation- this is considered a dismissal if you agree to comply with certain conditions; common conditions may include being alcohol or drug free or attending counseling. Admission or Plea- this is when you admit to some or all of the charges in the complaint. During the Pretrial Conference, the Court will explore Privileges such as the Victim’s 5th Amendment Privilege or any Marital Privilege that may prevent the Commonwealth from a successful prosecution. What if the victim does not testify? In many Massachusetts domestic assault and battery charges, the victim does not wish to testify against the defendant. Even though you may believe that the case has no merit, the alleged victim does not wish to testify, you should not expect the case to be dismissed immediately. The Commonwealth may still try to prove the case even without the testimony of the alleged victim. When domestic assault charges are brought in Massachusetts, the charges are brought by the State and only the prosecutor has the discretion as to whether a case is dismissed or not. A victim in a case has no authority to drop criminal charges, but can only express an opinion to the district attorney as to how the case should be handled. If the case cannot be resolved, the case will be scheduled for trial, which will typically occur before a jury but can also be before a judge. The district attorney takes all charges of domestic assault and battery seriously so it is important you hire an experienced Massachusetts domestic assault and battery attorney to represent you and to protect your rights. Call Attorney DelSignore immediately at 508-455-4755 or 781-686-5924 to set up a free office appointment.